Static land cover maps are often hard to use in different applications. But with a wide range of user groups, we need more elastic land cover mapping approaches to guarantee high quality products for each user. With our new methodology you can create individual land cover maps in high resolution tailored to your needs. Whether you need forest maps or grassland maps, this innovative approach gives the map and information you need. Read more to learn how to do it. 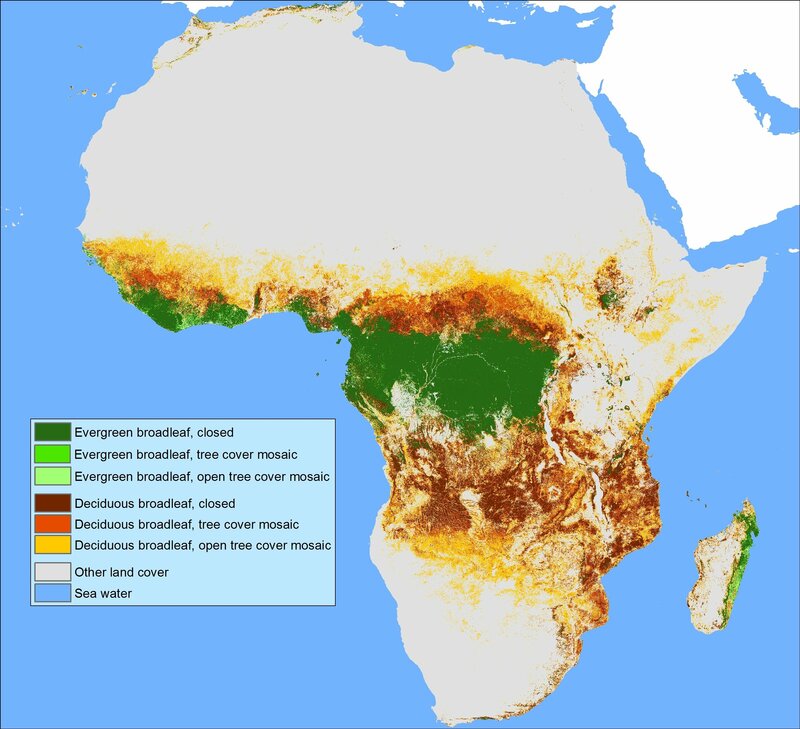 In one of our previous blogs, Africa mapped in unprecedented detail, we showed our novel land cover mapping approach which produces next to a typical discrete map also continuous cover fraction layers for forest, grassland, shrub, and bare. Each cover layer provides the fraction of the pixel that belongs to the given class. Through this additional information you can adapt the static land cover map to your specific needs. Needless to say that accurate and detailed land cover maps are essential to reach the 17 Sustainable Development Goals signed by the world leading countries to end all forms of poverty, fight inequalities and tackle climate change. This variety of different user groups and their different needs make it hard to create a one fits all land cover map. As a result most detailed land cover maps end up with a lot of mixed land cover classes which are hard to be used in different applications. This is where our novel mapping approach fits in. Let us show you some examples how to use our various available cover layers to create the land cover map you need. REDD+ stands for countries' efforts to reduce emissions from deforestation and forest degradation. This user group is mainly interested in the distribution of forests and its changes over time. VITO’s forest cover fraction layer allows to optimize the basic discrete map to a 7 classes forest related map which includes now an additional tree cover mosaic class. This can be realised by separating the current open forests class (15-70 % tree cover) in the basic map into two different classes - tree cover mosaic (30-70% tree cover) and open tree cover mosaic (15-30% tree cover) - by using the tree cover fraction layer and the forest phenology types. The tree cover mosaic class is now equal to the TREES3 dataset which is widely used in forest monitoring studies. The map accuracy of this customized map even increases to 80.4 % compared to the 74.3 % map accuracy of the basic discrete map. The Monitoring for Environment and Security in Africa (MESA) programme is a European Union funded project to not only support the African general public, scientists and institutions but also African decision-makers and planners in designing and implementing policies and development plans for sustainable development. Therefore detailed land cover maps are needed with a high focus on the natural conditions of the African continent. In order to tailor a map for MESA, we started with the four cover fraction layers and generated land cover classes better adapted for climate modellers compared to our basic discrete map. For example Savannah classes, comparable to the open forest class in our basic discrete map, are not required by the climate modelling users and therefore assigned to forest. The combined forest class was separated by the forest phenology types and we merged the “temporary” with the “permanent” water body class to end up with a customized 9 classes discrete map. This customized land cover map has an accuracy of 80.4 % compared to the 74.3 % accuracy of the basic discrete map. This shows that making a customized map can give you better results. 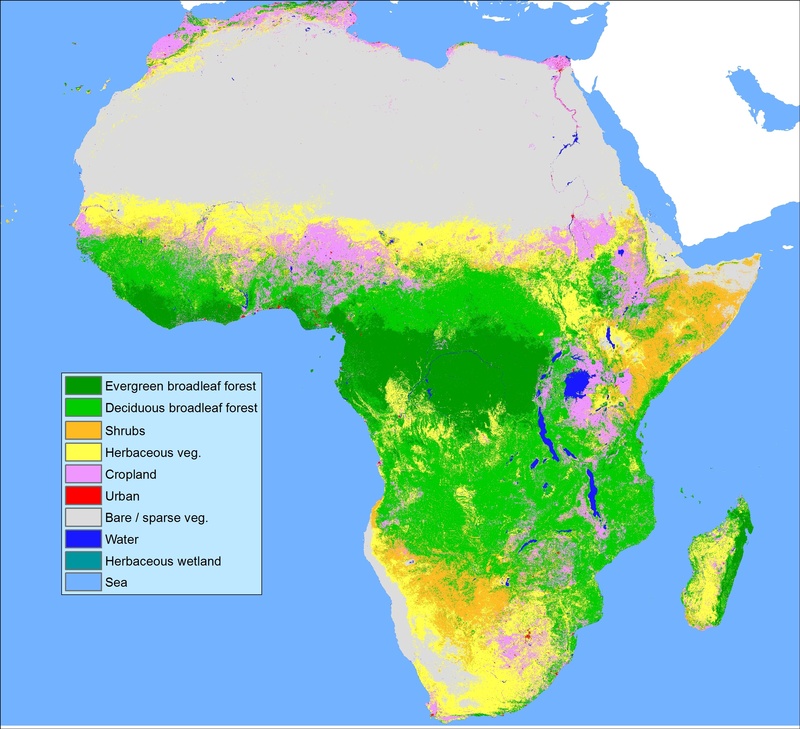 MESA land cover map for Africa 2015 customized by reclassifying the four cover fraction layers and including the rare classes from the 100m basic discrete map. © Copernicus Service Information. There are hundreds of more possibilities - so what are you waiting for? Start today and create your own map helping to reach your goals and to make our planet a better place. Check out our Geo-Wiki platform where you can visualize all layers without downloading them or provide feedback through the validation tool. Complete documentation and the datasets itself can be found on the Copernicus Global Land portal.